Nearby Notifications registers each Beacon to Google's Beacon Cloud service. Whenever a phone sees the Beacon, it says hello are you on the cloud and do you have anything for me? If it does, it brings down a notification. Nearby Notifications allows you to post a URL with a 40 character message on top. It allows you to manage the Beacons far away or remotely once set up. Once you buy the hardware from us (check below on which Beacon to pick). There is no associated cost from us. You do not have to pay a monthly fee for our side of the Beacons. Nearby Notifications is set up with Google's platform. Not our platform. Google makes you sign up for a trial, but the first year is free. Google Platform allows you to have 6 projects, which is similar to a folder. Each project allows you to have around 200 Beacons. After a year or if you add more than the 6 projects, you will pay the equivalent of 300 dollars or more depending on how many projects you add. It does not matter if you are in Real Estate, Marketing, or the restaraunt business. The Google Cloud Platform is fair to everyone! Will this work with iOS or iPhones? No, unfortunately this will only work with Android Devices. All phones need a mobile application to interpret the Beacon's signal. Unfortunately, Nearby Notification or Eddystone URL notifications only work the pre-installed Android's Nearby App. The phones don't care if it is iBeacon or Eddystone UID. They just need a way to interpret the signal, and Nearby Notifications or building a mobile application is a way to interpret that signal. 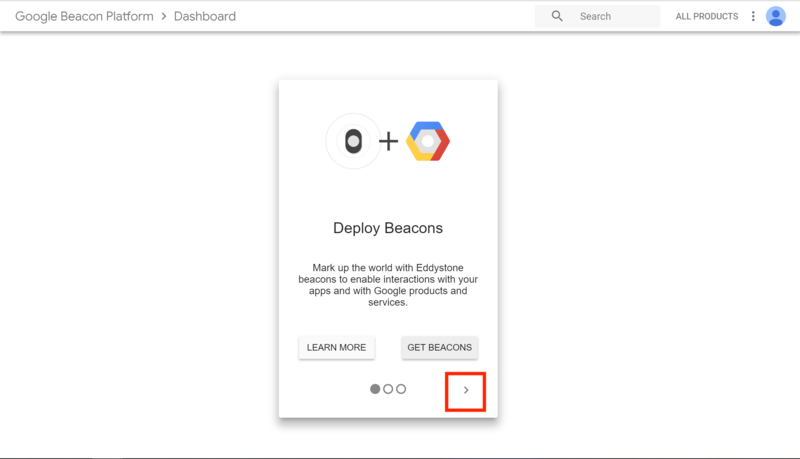 Eddystone URL is programming a URL directly to the Beacon. It can only be changed when you are in Bluetooth range of the device with your phone. Why is my notification not working or showing up? 1. A notification won't show if the attachment is not well received by users. 2. Make sure your Beacon has battery. Try replacing the batteries and checking if the Beacons show up in BC Reveal. 3. The URL is not secure or being verified by Google. Make sure that you ensure your URL is being verified by the URL Validator . Ensure that you have set up everything else right as well. 4. The Notification has already been seen or if the notification has been dismissed on a device recently, that device may not show another notification a period of time. The backoff policy is also reset if the user opens the Nearby section of Google Settings. 5. Your phone could be older or does not have at least KitKat or Bluetooth and Data. 6. Nearby Notifications typically scans for beacons for a few seconds after the screen is turned on. If the screen has not been turned on for a while, the device won't discover new beacons. Why don't I see any metrics? There a few reasons you may have registering issues. 1. Google no longer has Beacon Tools for iOS. It is only for Android devices. 3. Another Bug is once you add a description, the Beacon does get registered. We have found that even though you registered your Beacon it will not show up in "Registered Tab". However, it will show up under the "All My Beacons" tab. 4. For Beacons not showing up in Beacon Tools, make sure your Bluetooth is on, the Beacons are in Eddystone UID mode, and for extra troublesome beacons, give them new batteries. Having issues with Google Beacon Dashboard? 2. What you need to do is go to the dashboard and click this arrow three times. Then you should see your Beacons. See the screenshot below.